• No More Lies! Vote for the Candidate Who Will Keep the Members Informed! •Stop Discrimination Against New Hires • Stop the Harassment of Women Workers! • Stop the Pressuring of Workers with Seniority to Retire! • Against All Injustices – from Cuomo’s MTA Management to Trump! Conductors and Tower Operators have a chance to send a message to management and to Local 100’s leaders when we vote in the upcoming election for the vacant Executive Board position representing the department. Almost six months have passed since Local 100’s leaders conspired with management to lie about their latest contract. Their flyers promoting the deal promised that it had “No Givebacks! No Concessions of Any Kind!” But we now know that it included a new limit on how much banked overtime we can use as days-off each year – a concession that new hires and workers with families to care for would be hit hardest by. The rank-and-file’s anger at that giveback has forced management to hold off implementing it in RTO so far, but that could quickly change. Local 100’s leaders also promised us an above-inflation raise but instead stuck us with a deal that sees our wages continue to fall behind the rising cost of living. And the contract entrenched the Tier 6 pension plan that tripled pension deductions for new hires (in effect a massive pay cut!) and gave management a new incentive to harass workers with seniority into retiring. Meanwhile, management continues to harass members on the job, pushing us to work harder for longer, pressuring us over comfort and lunch breaks, disciplining us over petty uniform rules, frequently targeting new hires and women employees for the worst treatment while pressuring all of us to work in conditions that are often oppressive and even unsafe. Transit workers are sick and tired of the TA getting away with murder, and of our own union leaders lying to us while they enjoy their highly-paid positions away from the stress of actual hard work. who has fought for the union to not just defend its members, but for it to also support broader struggles like the Black Lives Matter movement and protests against the racist authoritarian Trump in the White House. With his ten-year record of speaking truth to power, supporting co-workers against management, and fighting for the union to mobilize in defense of the entire working class, John Ferretti has proven that he has those qualities. Electing John won’t solve all transit workers’ problems – far from it. But it will give us a representative on our union’s top body who can be relied on to keep us informed, to speak out against dirty deals with the bosses and politicians, and to support every effort to unite workers in solidarity. And most importantly, electing John can encourage other members who are similarly committed to mobilizing workers in struggle to step forward and start building a new leadership for the union. John started working for the TA as a conductor in 2006 and didn’t even wait for his probationary period to be over before standing up to management. In one important case he backed up a train operator who was brought up on false charges and helped him escape any penalty. John became a Shop Steward in 2008 and soon played a role in helping organize RTO workers’ protests against NYCT closing the Van Cortlandt pick location. He also played a leading role in safety enforcement and strict adherence to the RTO rulebook, despite management pressure to cut corners. He has continued to stand up to management ever since. John has also played a prominent role in challenging the betrayals of Local 100’s leaders, especially through his role with fellow socialist transit workers in producing Revolutionary Transit Worker newsletter. This has included campaigning against the Tier 6 pension deal and against the last sellout contract, which Conductor/Towers members voted resoundingly to reject – see Don’t be Fooled by Samuelsen’s Lies! Vote No on this Wage-Cutting, Giveback Contract! Revolutionary Transit Worker No. 63. Most recently, John played an important role in supporting conductors at Grand Central Platform Control who won a long fight against management harassment. In July 2016, when he was working as a road conductor on the #6 line, members who knew John as a Shop Steward approached him to share complaints about unsafe working conditions. They complained about the high heat and lack of acceptable ventilation in some of the stations and John successfully pressured management and the union leadership to start addressing those issues. Conductors from Grand Central then shared complaints about abuse they were suffering from Train Dispatcher Baez, a Platform Control Supervisor. Baez would scream at them and attempt to humiliate them in front of customers and their co-workers, often directing his worst abuse at women conductors. The conductors continued to stand strong and John joined them in pressuring both the union leadership and upper management to take action. He went to the NYCT Office of Equal Employment Opportunity (EEO) and filed complaints against Baez and helped organize union members to be accompanied by union representatives when they were interviewed by the EEO. Baez and the rest of management, however, had underestimated the Grand Central Conductors. They kept writing up Baez for his abusive behavior until management finally gave in and called a meeting of all the workers to apologize to them for the harassment they had suffered. Management also promised to stop collective disciplinary actions, end the harassment of conductors taking comfort breaks, permit longer lunch breaks, and agreed to uniform changes because of extreme cold and heat conditions in winter and summer. And Baez? He was first sent to “management re-training” and had his overtime eliminated. Then, on May 5, Baez was finally removed from his position as Grand Central Platform Control Dispatcher. 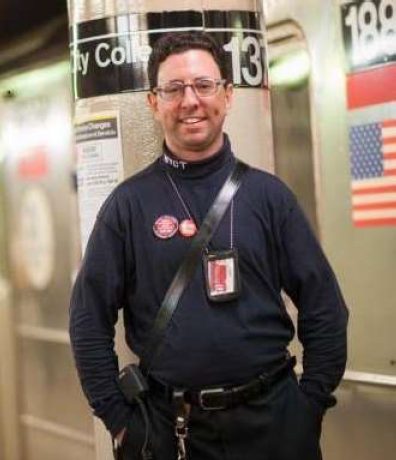 John’s never been shy when it comes to sharing his socialist political views and works with other like-minded transit workers in producing the Revolutionary Transit Worker newsletter. And of course plenty of workers remain far from convinced that the working class could ever unite against the divisions of racism and sexism to challenge the capitalist system. But in recent union elections, hundreds of transit workers have voted for John and his fellow socialists to hold union office even though they don’t share their revolutionary socialist politics. That’s because they know that they can be trusted to always keep them informed, tell them the truth, support them against management’s injustices, and fight for the union to mobilize in defense of its members and the whole working class. But it’s important to know that revolutionary socialist politics guide John and the other supporters of RTW to fight for Local 100 to mobilize in struggle against racism and sexism, against management’s abuses, and against all the attacks on the working class. That’s because they believe that only through united, independent struggle can working-class and oppressed people defend their interests and ultimately rise to challenge the capitalist system. That’s why RTW supporters worked to get the union to mobilize in support of Black Lives Matter protests against racist police injustice and most recently, to join and build protests against Trump. The union leadership has resisted these efforts, but it will be much more difficult for them to continue to do so if John is elected to the Executive Board. RTW supporters have also fought for the union to mobilize in defense of the rest of the working class against economic attacks. They have, for example, campaigned for the union to really oppose fare hikes that not only hurt working-class and poor people, but are designed to encourage them to think that transit workers are greedy when we fight for better wages and benefits. And with Trump and the Republicans pushing to overturn “Obamacare” and drastically cut Medicaid, they have begun a campaign for Local 100 to call on the AFL-CIO and all other unions to build a massive March on Washington to defend healthcare. That campaign began last week with motions for a March on Washington being unanimously approved for consideration by both AM and PM meetings of Train Operators. Public sector unions need to have broad working-class support if they are to effectively mobilize against the attacks on them. This is especially true now, since Trump and Republicans are promising that after their healthcare “reform” they will move to deal a crippling blow to the labor movement, including TWU Local 100, by passing a national “right-to-work” law (House Resolution 785) that would overturn unions’ right to win the requirement that all workers in an enterprise be dues-paying union members. And while fighting to mobilize the biggest possible struggles against the menace of the Republicans in power today in Washington, John and his fellow socialists have not hesitated to explain that the Democratic Party functions as the capitalist class’s “soft cops” who use their allies in the leadership of this country’s unions to keep the working class and poor passive while enforcing a gradual worsening of living standards for the working class. This is especially important for transit workers to understand since it is Democratic Governor Andrew Cuomo who is the MTA’s ultimate boss, and his attacks on transit workers have been driven by his loyalty to the capitalist class. The Tier 6 pension giveback, for example, was made so that Cuomo could afford to pay Wall Street more than $30 billion in debt-servicing payments. This confirms that while transit workers are public employees, we’re getting screwed like the rest of the working class so that Wall Street can profit. That’s why John and his fellow socialist transit workers have argued that the working class needs a political party that bases itself on their struggles and challenges the two parties of this country’s capitalist ruling class. And they are clear that they believe that the continued experience of the worsening conditions of life under capitalism, and of working-class and oppressed people’s struggles in defense of their interests, will convince growing numbers of workers that the party they need must stand for a revolution that ultimately overthrows the capitalist system entirely. RTW’s conversations with our fellow transit workers about capitalism and socialism will continue. But our immediate message is simple. Conductors and Tower Operators need a representative on the Executive Board who can be trusted to keep them informed and be a voice for solidarity and struggle against attacks by management’s and the politicians. John Ferretti is such a candidate. We hope that members won’t just prepare to vote for John, but will get involved in the campaign to convince their fellow workers to do the same!